NASA has chosen Jezero Crater as the landing site for its upcoming Mars 2020 rover mission after a five year search, during which every available detail of more than 60 candidate locations on the Red Planet was scrutinized and debated by the mission team and the planetary science community. The rover mission is scheduled to launch in July 2020 as NASA's next step in exploration of the Red Planet. It will not only seek signs of ancient habitable conditions - and past microbial life -- but the rover also will collect rock and soil samples and store them in a cache on the planet's surface. NASA and ESA (European Space Agency) are studying future mission concepts to retrieve the samples and return them to Earth, so this landing site sets the stage for the next decade of Mars exploration. "The landing site in Jezero Crater offers geologically rich terrain, with landforms reaching as far back as 3.6 billion years old, that could potentially answer important questions in planetary evolution and astrobiology," said Thomas Zurbuchen, associate administrator for NASA's Science Mission Directorate. "Getting samples from this unique area will revolutionize how we think about Mars and its ability to harbor life." Jezero Crater is located on the western edge of Isidis Planitia, a giant impact basin just north of the Martian equator. 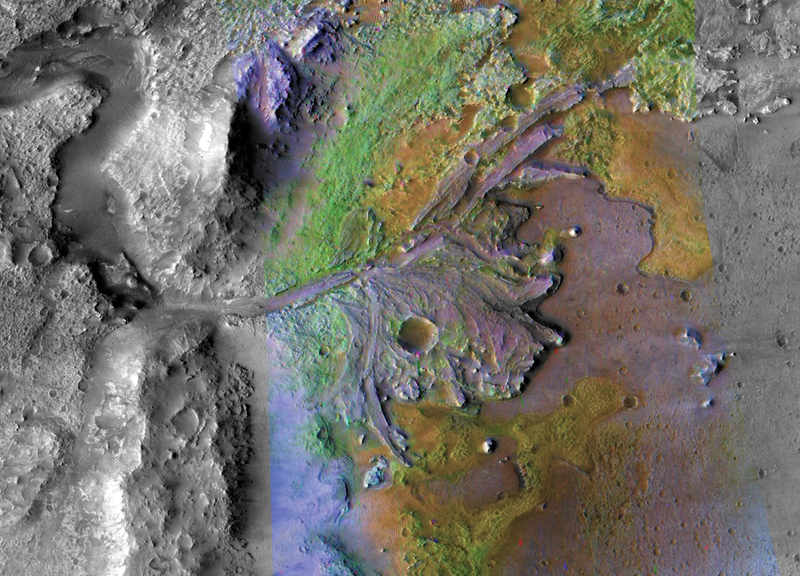 Western Isidis presents some of the oldest and most scientifically interesting landscapes Mars has to offer. Mission scientists believe the 28-mile-wide (45-kilometer) crater, once home to an ancient river delta, could have collected and preserved ancient organic molecules and other potential signs of microbial life from the water and sediments that flowed into the crater billions of years ago. 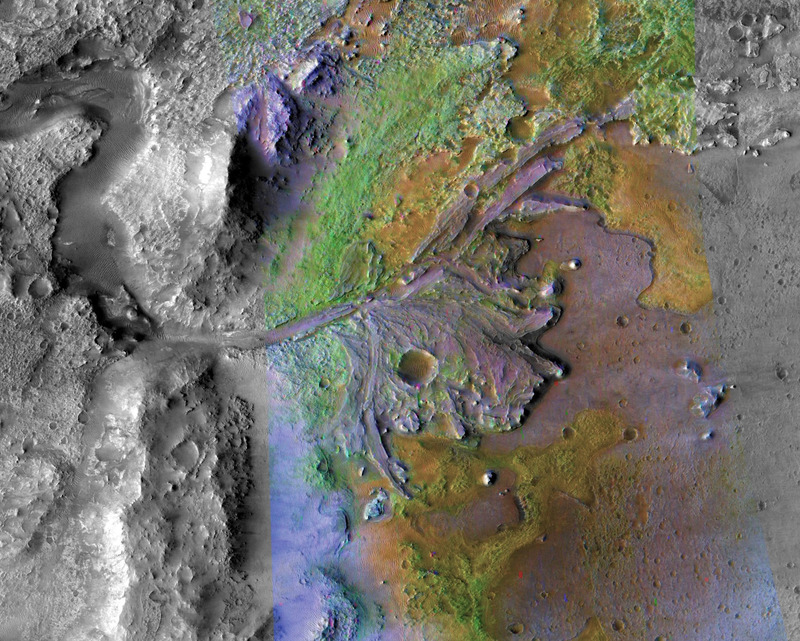 Jezero Crater's ancient lake-delta system offers many promising sampling targets of at least five different kinds of rock, including clays and carbonates that have high potential to preserve signatures of past life. In addition, the material carried into the delta from a large watershed may contain a wide variety of minerals from inside and outside the crater. The geologic diversity that makes Jezero so appealing to Mars 2020 scientists also makes it a challenge for the team's entry, descent and landing (EDL) engineers. Along with the massive nearby river delta and small crater impacts, the site contains numerous boulders and rocks to the east, cliffs to the west, and depressions filled with aeolian bedforms (wind-derived ripples in sand that could trap a rover) in several locations. 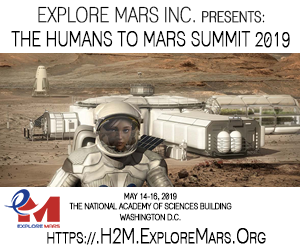 "The Mars community has long coveted the scientific value of sites such as Jezero Crater, and a previous mission contemplated going there, but the challenges with safely landing were considered prohibitive," said Ken Farley, project scientist for Mars 2020 at NASA's Jet Propulsion Laboratory. "But what was once out of reach is now conceivable, thanks to the 2020 engineering team and advances in Mars entry, descent and landing technologies." When the landing site search began, mission engineers already had refined the landing system such that they were able to reduce the Mars 2020 landing zone to an area 50 percent smaller than that for the landing of NASA's Curiosity rover at Gale Crater in 2012. This allowed the science community to consider more challenging landing sites. The sites of greatest scientific interest led NASA to add a new capability called Terrain Relative Navigation (TRN). TRN will enable the "sky crane" descent stage, the rocket-powered system that carries the rover down to the surface, to avoid hazardous areas. The site selection is dependent upon extensive analyses and verification testing of the TRN capability. A final report will be presented to an independent review board and NASA Headquarters in the fall of 2019. "Nothing has been more difficult in robotic planetary exploration than landing on Mars," said Zurbuchen. "The Mars 2020 engineering team has done a tremendous amount of work to prepare us for this decision. 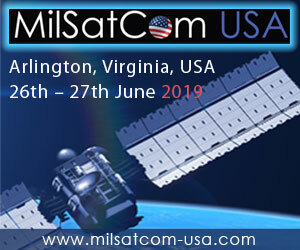 The team will continue their work to truly understand the TRN system and the risks involved, and we will review the findings independently to reassure we have maximized our chances for success." Selecting a landing site this early allows the rover drivers and science operations team to optimize their plans for exploring Jezero Crater once the rover is safely on the ground. Using data from NASA's fleet of Mars orbiters, they will map the terrain in greater detail and identify regions of interest - places with the most interesting geological features, for example - where Mars 2020 could collect the best science samples. The Mars 2020 Project at JPL manages rover development for SMD. NASA's Launch Services Program, based at the agency's Kennedy Space Center in Florida, is responsible for launch management. 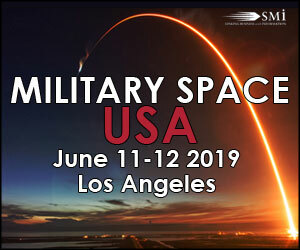 Mars 2020 will launch from Cape Canaveral Air Force Station in Florida.